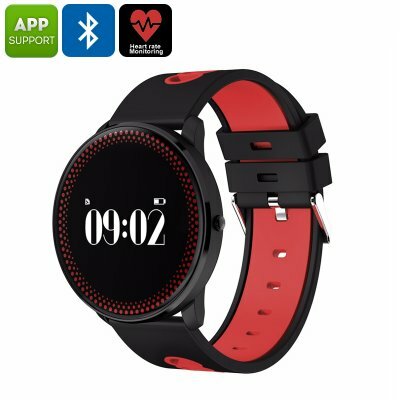 Successfully Added ORDRO CF007 Bluetooth Watch - Heart Rate Monitor, Blood Pressure, Calories Burned, Pedometer, App Support, Bluetooth (Red) to your Shopping Cart. Keep track of your daily exercise levels with the ORDRO CF007 fitness tracker bracelet. This stylish Bluetooth watch treats you to all the basic health and fitness features needed to work towards a healthier future. Thanks to its pedometer, you’ll be constantly up to date about the number of steps you took and distance covered throughout the day. Additionally, its heart rate monitor provides you with valuable information on the status of your stamina. From now on, you’ll be able to optimize all your workouts and make sure you’ll always meet your daily exercise needs. With an accurate calorie counter in place, you can always see how many energy you have burned during previous exercise sessions. To make sure that you get enough rest in between your workouts, the Bluetooth watch comes with a sleep monitor. This feature provides you with detailed feedback on the quality of your sleep. The watch itself is compatible with both iOs and Android phones via the dedicated mobile application. On its 0.96-Inch display, this Bluetooth watch treats you to sharp images. It furthermore packs an 80mAh battery that provides you with enough juice to get through numerous days or regular usage. Therefore, you’ll no longer have to worry about running low on energy in the middle of a workout session. The watch features a stylish and comfortable design, making it fit to be worn at any occasion.